Yesterday's San Felipe Weather was warmer and sticker than it has been in a while with temperatures on 95 degrees at Weather Central. This Mornings temperature has started at 80 and is expected to get to 95 degrees here near the water again. 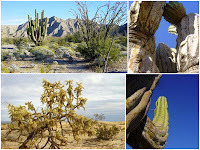 Mexicali & San Felipe locals believe that during the hot weather there is a 10 degree difference between Mexicali & San Felipe...in San Felipe's favor. As far as precipitation all maps indicate that the cloud cover and chance of rain is likely to be contained to the border area. Our weather should remain warm to hot and just right for going to the beach...Heat Index will be up...Enjoy! Chance of Rain. Scattered Clouds. High: 105 °F . Wind North 8 mph . Chance of precipitation 20% (trace amounts). Heat Index: 102 °F . Clear. Low: 80 °F . Wind South 6 mph . Heat Index: 84 °F . Clear. High: 105 °F . Wind NE 8 mph . Heat Index: 100 °F . Chance of Rain. Scattered Clouds. Low: 78 °F . Wind South 8 mph . Chance of precipitation 30% (water equivalent of 0.02 in). Heat Index: 86 °F . Chance of Rain. Partly Cloudy. High: 105 °F . Wind South 8 mph . Chance of precipitation 30% (water equivalent of 0.02 in). Heat Index: 104 °F . Clear. Low: 78 °F . Wind SSW 6 mph . Heat Index: 86 °F . Chance of Rain. Scattered Clouds. High: 107 °F . Wind ESE 8 mph . Chance of precipitation 20% (trace amounts). Heat Index: 109 °F . Clear. Low: 82 °F . Wind South 6 mph . Heat Index: 89 °F . Overcast. High: 107 °F . Wind SE 8 mph . Heat Index: 96 °F . Partly Cloudy. Low: 77 °F . Wind SSE 6 mph . Heat Index: 89 °F . Chance of Rain. Scattered Clouds. High: 104 °F . Wind ESE 8 mph . Chance of precipitation 20% (trace amounts). Heat Index: 111 °F . Scattered Clouds. Low: 78 °F . Wind SW 4 mph . Heat Index: 93 °F .